Today I will share about my CamStudio and VirtualDub settings for recording time-lapse videos (meant for Youtube). I always forget about the setup I use so I thought of posting it here to keep it handy. If you are interested, feel free to read on! My goal for this setup is to output a video with a small file size and good quality for Youtube. So far, I am alright with my final videos. You can check out the results on any of my recent uploads (on sped up digital painting) here. Just to give you a rough idea: After squishing a 10.5 hour video into 2.5 minutes, I ended up with a file size of 70 MB. After adding audio, the final size was 77.5 MB. After compressing a 6 hour video to 3 minutes with audio added, I got 128 MB. Another 6 hour video compressed to 2 minutes got me 90 MB. All these are set at 720x480, 24 fps. Well the results vary across my videos and I think this also depends on the amount of movement and colors you have on your screen during recording (not sure about this, is this right??). Anyway, if you would like to try my setup, you can follow along. 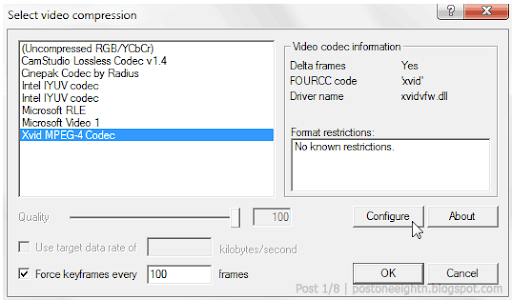 LAME ACM - audio codec; this is necessary if you plan to use audio. VirtualDub: I suggest getting the stable 32-bit (x86) version whether you are using a 64-bit system. This will enable you to use 32-bit codecs and plugins. Xvid: Make sure the version you have also includes a 32-bit version for it to work in VirtualDub. LAME ACM: Installation instructions are included at the download page. If you are using a 64-bit system, check the installation procedure included in the ZIP file. 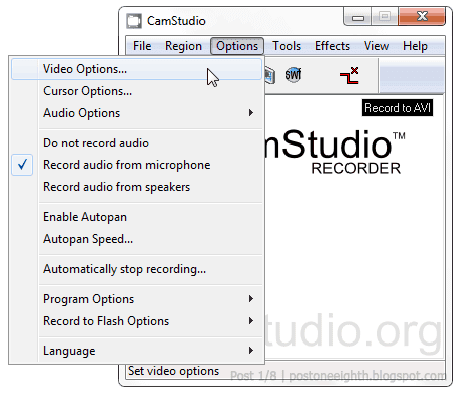 CamStudio could not record the AVI file using the current compressor. This can be fixed by making the area/region you are recording have a width and height divisible by 2. I came across this solution in this post here. Hopefully this will work for you too. In CamStudio, go to Options » Video Options. Go to the Video Options in CamStudio. Capture Frames Every: 100 milliseconds -- a good explanation about this setting can be found here. Setting for the Video Options. 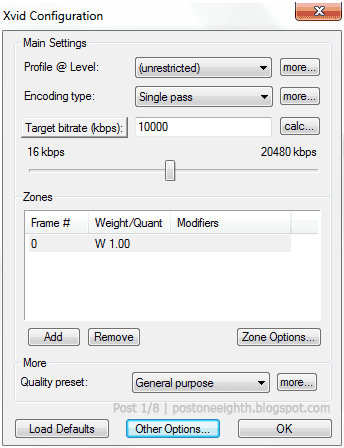 Target bitrate (kbps): 10000 | Note: If you don't see "Target bitrate", just click on its button until it changes to it. A problem I had when selecting Xvid as the compressor was that a blank window (Xvid status - this may not be blank on your own system) pops up whenever I start recording. If you want to turn this off and are not particular about the encoding status, click on the Other Options button and uncheck "Display encoding status" then click OK.
Once you're done with the settings, click OK on the Xvid Configuration and another OK for the Video Options. Cursor options: Options » Cursor Options. Show Cursor; Uncheck Highlight Cursor. I suggest breaking your recording into 10-20 minutes rather than going for a full hour for example. In my case, I noticed a lag in my system when I go over 30 minutes or so. And if anything goes wrong (computer crash..), you won't lose the entire recording. This can be easily merged in VirtualDub later anyway. To keep your settings in CamStudio: Options » Program options » Save settings on exit (checked). Using VirtualDub, I further compress the video, change the frame rate (to speed it up) and add audio. 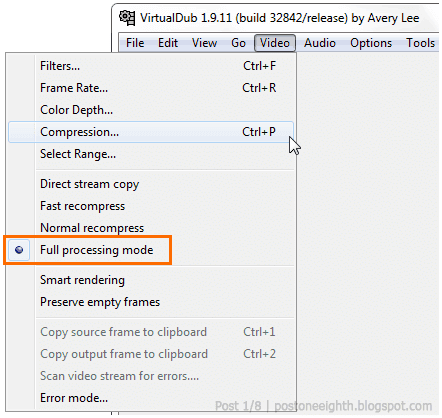 Select Full processing mode (Video » Full processing mode) to enable video compression. Settings for the video compression. 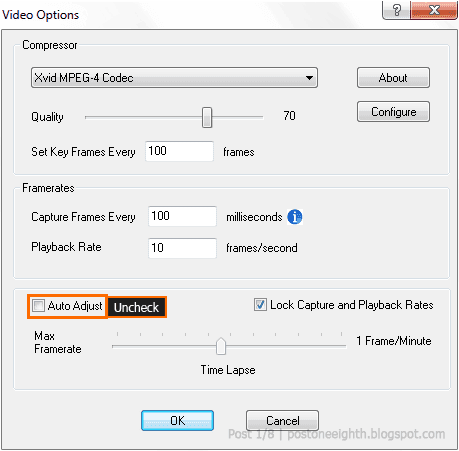 Click Configure to once again adjust the Xvid setting. 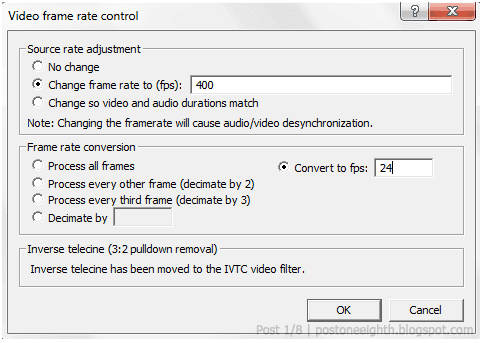 Set the Target bitrate to around 6000 (test your output video if the quality is still alright). This is to lower the file size of the final output. If you are wondering why I didn't start with 6000 while at CamStudio, it's just because I want to experiment with the values first. If 6000 makes the quality of the final output of my video too low, I still have room to adjust the bitrate. I'm not sure whether doing this has some kind of drawback. But yeah, it still works for me. Change frame rate to (fps): 400 - this will completely depend on how fast you want your time-lapse video to be. Just hit OK and play the video to preview the result. Adding audio is optional. I've tried uploading videos without any audio at Youtube and it still worked fine. 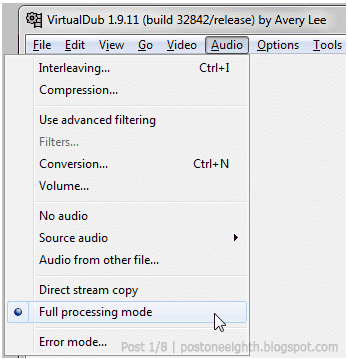 To enable compression of the audio, set it to Full processing mode (Audio » Full processing mode). 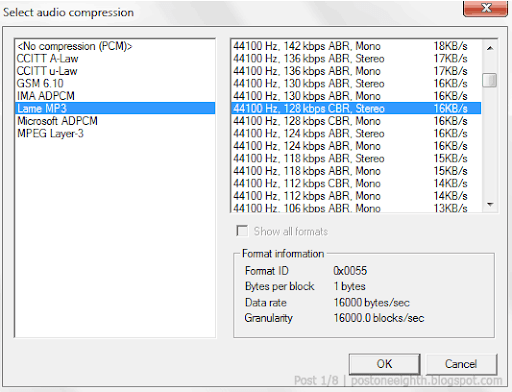 I usually use 44100 Hz, 128 kbps CBR, Stereo - this depends on the audio you will add. I just use the same sampling rate and channel (Stereo/Mono) of the audio file. Note: If the list isn't complete, just check "Show all formats". I've tried experimenting with the audio settings but I don't really know much about it so I will just leave it at that. So far this is the best result I got but I encourage you to try other settings as well. You can save your current VirtualDub settings by going to File » Save processing settings (Ctrl+S). Next time you need it, simply load it via File » Load processing settings (Ctrl+L). And so, this is the setup I use. Just remember that my settings might not work for you so just experiment and try out other options. Anyway, hope you still find this post useful. If there's anything I missed or messed up, let me know! Comments are welcome. See ya! Really helpful - thank you.